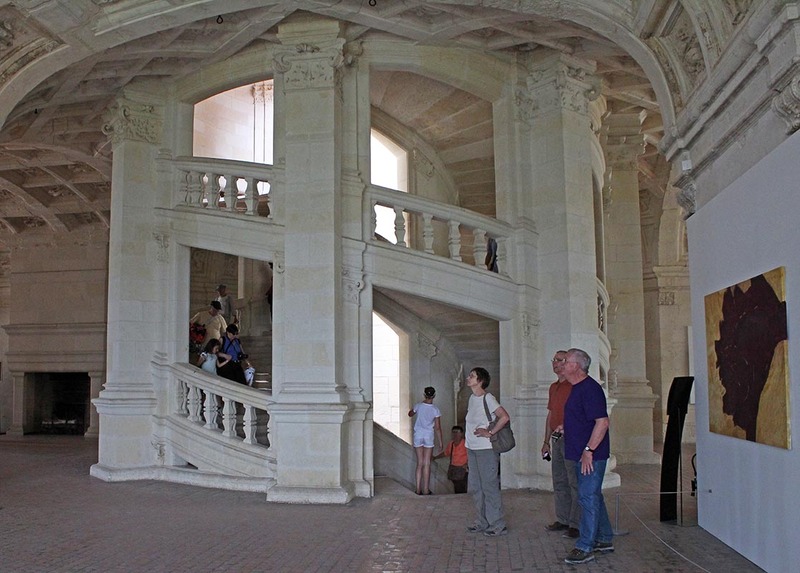 I got a request for a photo of Chambord's double-helix stairway. I did take a couple of pictures, but they really don't give you a feel for how it works. Still, here's the best one; you tell me what you think. The plan of the main keep is in the form of a cross with the staircase at its center. The picture includes our recent visitors, Harriett and Tom, and Ken standing in front of the stair. They were admiring the second floor's coffered ceiling, I think. You can see two balustrades in this portion of the staircase. The section closest to floor level (where you see the people descending) is one stair, and the balustrade directly above that is along the second stair. Both stairs wind around a central light well above which is the windowed lantern in the top center of the castle. They say that the stair was inspired, if not designed, by Leonardo da Vinci. I'm not sure anyone knows for sure. 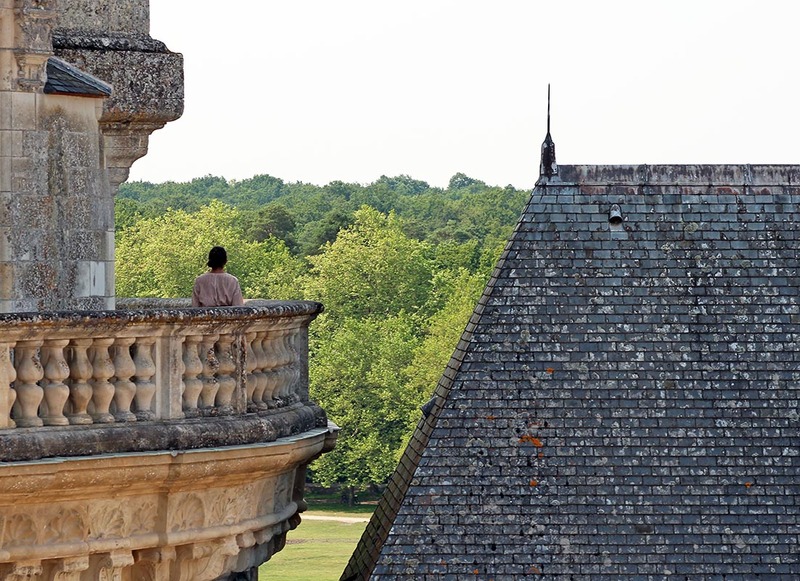 The roof terrace at Chambord is a world unto itself. It's a labyrinth of passages around the chimneys and towers that crown the building. And the views of the park surrounding the castle are spectacular. To get to the roof, visitors climb the central stair, a double-helix (circular) stairway which is actually two staircases that wind around each other but never meet. Could that be the Princesse de Clèves? There were quite a few people up there when we climbed up, but the terrace is spacious enough that it didn't feel crowded. Except, maybe, on some of the narrower passages that wind around the round towers. ...to your regularly scheduled castle. Still at Chambord, this is a closer view of some of the chimneys and other ornamentation as seen from the roof terrace. I wonder how many thousands of slate tiles are on those roofs. Some of the detail on the castle's roof. Now that the past few days of thunderstorms are over, the temperature has cooled down significantly and the humidity is gone. It's not cold, but it feels chilly. Not to worry, the forecast has us moving back up to hot during the week. A couple of you asked to see some pictures of the vegetable garden. Here 'ya go! After a slow start during our cold and wet spring, summer arrived at the beginning of July and did its thing. The plants are growing well and starting to mature. I've already harvested some zucchini and cucumbers, but the tomatoes will be a while yet. 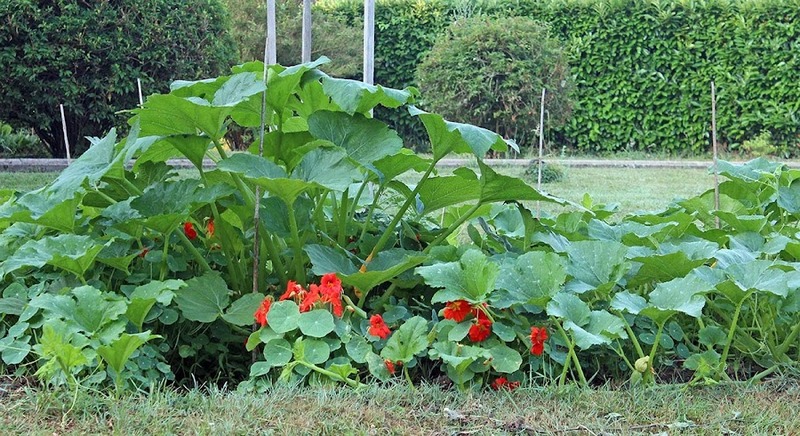 The winter squash plot with nasturtiums sprinkled about. The nasturtiums re-seed themselves and come back every year. 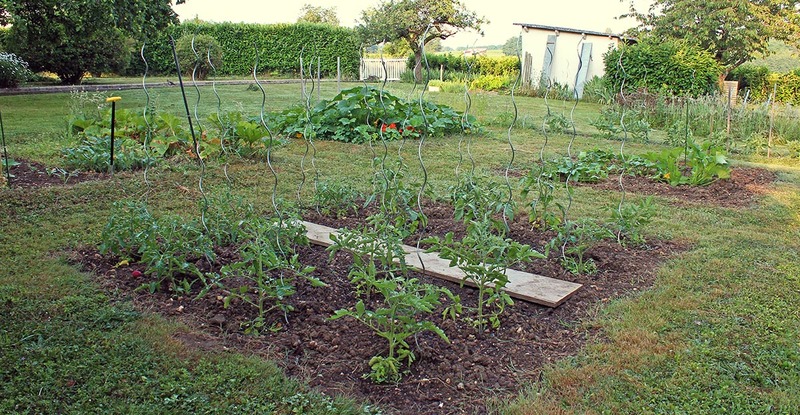 Long-time readers will remember that the garden's four-square design is based on a jardin potager (kitchen garden) that I saw at the Château de Fougères-sur-Bièvre back in 2003. I laid out each square at four meters on a side with a meter-wide grass strip separating them. The actual dimensions have probably changed over the years. Four squares in the background and part of the long strip in front. We've since added a long planting strip beside the four squares for more space. You can see part of it in the photo above. This year it's home to eight tomatoes, some lettuces, and radishes. The radishes are all done now and what's left has gone to seed. I'll dig them up soon and put in some jalapeño seedlings I've got going. Zucchini in the foreground and sixteen tomato plants in the back. This year I've got twenty-seven tomato plants. They're a mix of varieties that I grew from seed and I'm not sure now which varieties they are. Three of the plants are volunteers; dozens of cherry tomato seeds sprouted in the plots from last year's fallen fruit. I kept three of them since I didn't plant any cherry tomato seeds this year. All four squares (mostly) and the strip behind. It's not your imagination or my crazy photography, this part of the yard is on a slight slope. There are also four zucchini plants and four cucumbers, all seed-grown. Our rhubarb patch is a row in one of the squares, but that's done now so I'm letting the remaining leaves feed the rhizomes below ground (and the weeds are enjoying being left alone). We've also got a patch of collard greens and kale in the same plot. I tried a row of sweet peas there, too. We got one meal out of that. 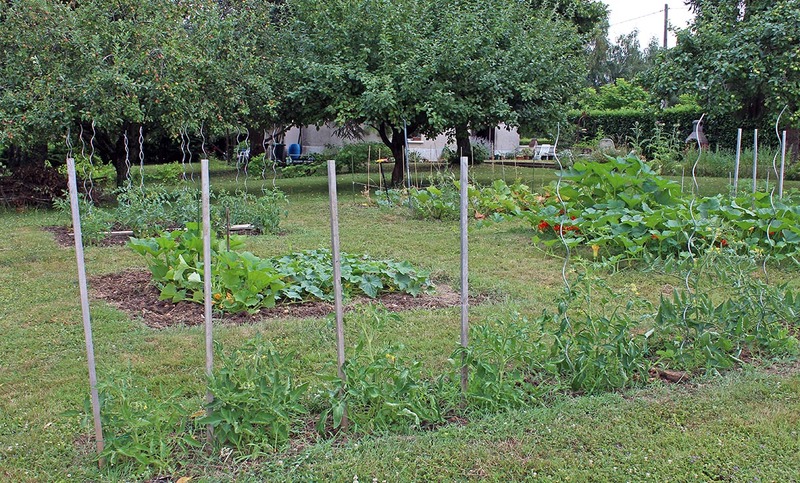 So that's the state of the vegetable garden at the end of July 2013. It's not the most lush and luxuriant garden we've had over the years, but with the crazy weather we've been having lately, it's doing just fine. Everything at the Chambord castle is super-sized. There are three main levels, plus the attics (no visitors allowed) and the roof terrace (visitors are allowed on the roof). Each level is about equal to two standard floors. According to Wikipedia, the castle contains over four-hundred rooms and nearly eighty stairways. The tip of the lantern over the central staircase rises 32 meters high (about 105 feet). That's the equivalent of a ten-story building. 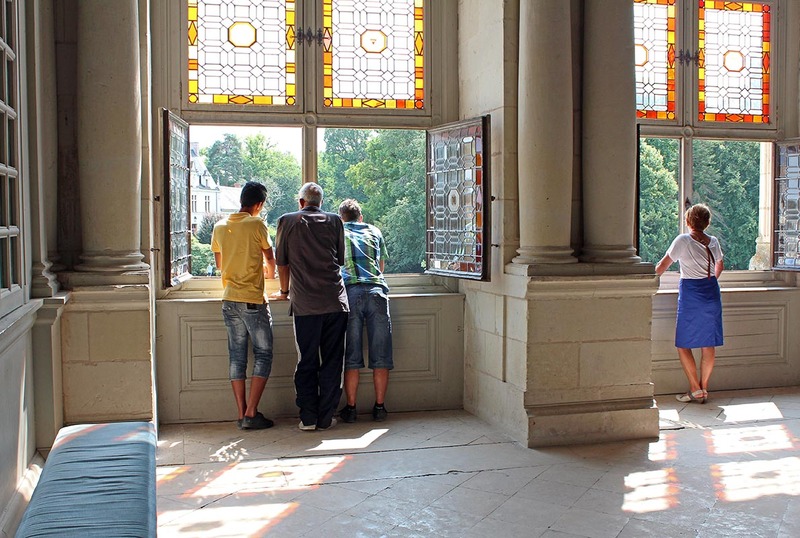 Unidentified tourists looking out from the chapel over the castle grounds on a sunny afternoon. I took this photo in the chapel, which is located in the western tower (all the way to the right in the banner photo above). Those windows look south, so you can't see them in the banner photo. Because it was such a nice day, many of the castle's windows were open and visitors were enjoying the views. 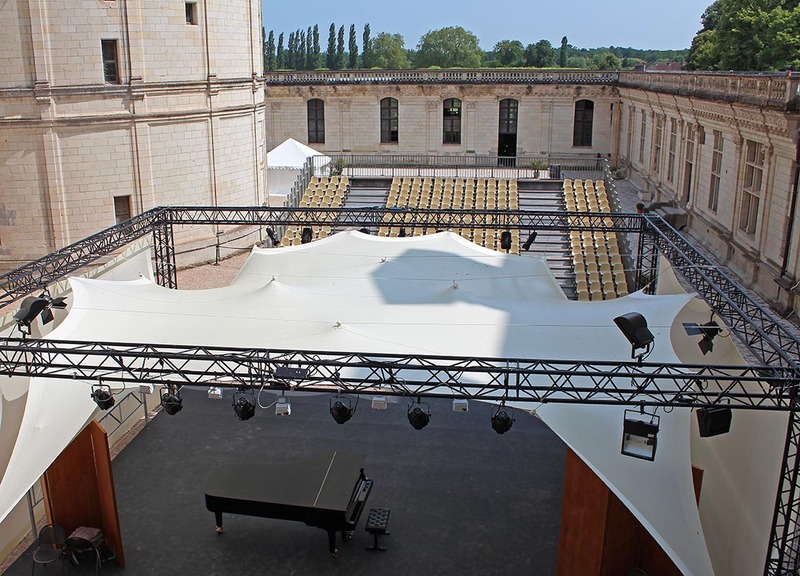 As we wandered through the Chambord castle, we walked out onto a balcony and noticed this temporary theater set up in the western courtyard. I thought it was amazing, so I took a picture. I guess they do concerts and such in there. A piano just waiting. Mozart? Rachmaninoff? Bizet? Or maybe something more modern? Summer is just churning along. I'm very happy, even though it can get a little uncomfortable at night. It's not so bad for a few nights, given that we have nice hot days and the vegetable garden is loving it. Our winter squash looks like a bumper crop is on its way. Ken's in Paris this weekend, coming home on Sunday. I'm on animal patrol. And I'm working in the garden. I enjoy watching it all grow. This morning around 3:30 we had thunderstorms. I got up at two and went downstairs (not an unusual thing for me to do). I noticed the moon and the stars, but also some flickering light. I thought it was something electronic in the house but it turned out to be lightning in the north. I went back upstairs for a better view. What I saw was like something out of "Close Encounters of the Third Kind." While my house was under starry skies, to the north was a huge billowing cloud, lit almost constantly from within by bright flashes of lightning. I couldn't hear any thunder, but I was mesmerized by the sight. After a few minutes I went back downstairs and turned on the computer to have a look at the internet weather site. Sure enough, a big storm was moving by to our north, headed up toward Paris. I then noticed the radar showing two more large systems following it, coming directly toward us from the southwest. Uh-oh. I battened down the hatches, which means I turned off the computer and the modem/router, closed windows and shutters, and spread plastic in the kitchen in case the roof leaked again. I settled back into bed around three o'clock. I could hear the thunder approaching this time and the lightning got brighter. I was up and down looking out the roof window. The lightning was both beautiful and scary. One nearby strike was so bright that I couldn't see for few seconds after. The rain started about four o'clock, but it was a much gentler rain than I expected. I realized the storm was not hitting us full-on. We were on its southeastern edge as it moved northward toward Paris. I drifted in and out of sleep for a while. Callie barked at a particularly loud thunder clap (the house shook) before heading downstairs to hide. As the storm got farther away, I opened up the windows again to let the cooler air in. Around six I got up, after a bit more fitful sleep, to restart the electronics and check the radar again. It's all over for us for the moment, but Paris is getting it as I write this. Luckily there had been no leak in the kitchen. 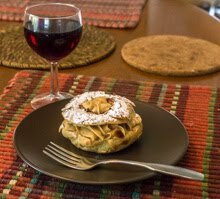 So I made a pot of coffee, fed the cat, and logged on to blogger to add this to my post. Maybe better. I have no idea what is going on in this photo. It's long telephoto shot of a few boats in the canal that flows in front of the Château de Chambord. The bright red wigs (at least I think they're wigs) are funny enough, but then there's the huge white Marie-Antoinette thing on the right. They were quite far from where I was standing. I didn't even notice the white wig until I looked at the picture at home. I'm not even certain that they're all women. I saw no signs of any filming (like for a television commercial) or other photography (like for a print ad). Just a bunch of people in a few rental boats. You see the weirdest things when you venture out. 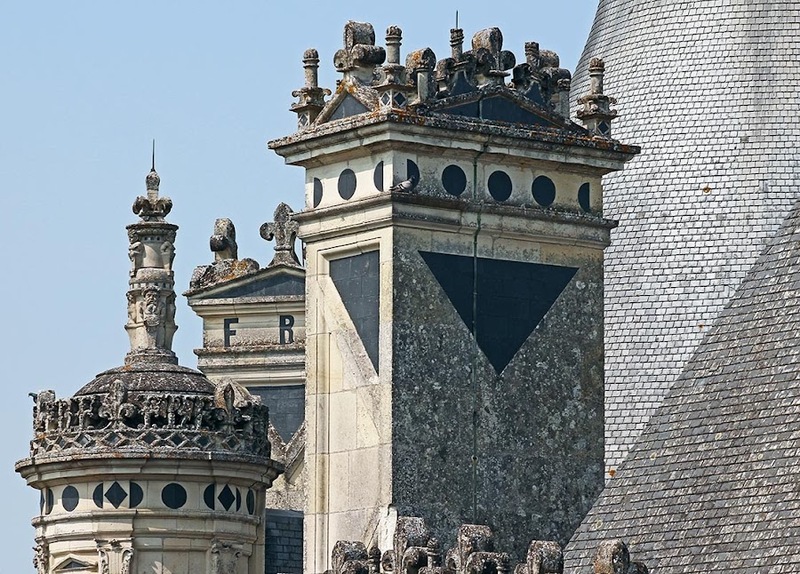 You can tell from this shot that some work has been done on the stones that make up the chimneys and window frames on the roof of Chambord castle. At least on the left-hand side. I remember when the scaffolding was up and now that it's down the result is clear. I wonder when they'll do the other side? Looking up at the castle's roof. Once inside, you can climb the stairs and walk around up there. And so we did. I took this photo from inside the courtyard looking at the southern façade of the building, the back side if you're looking at the banner photo. Visitors enter in the center and this is the view they get before going into the castle itself. Not bad! 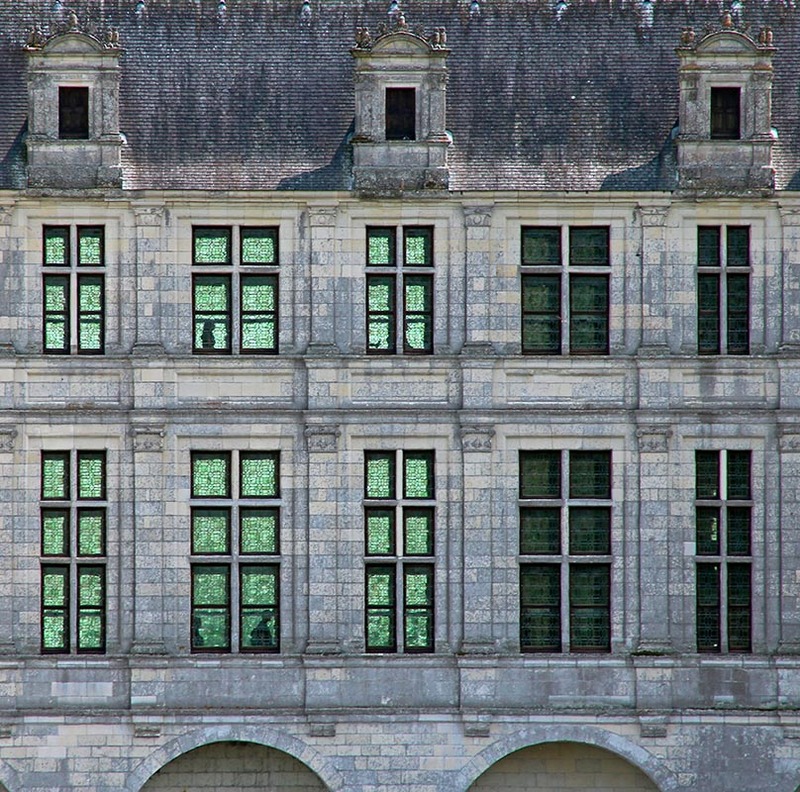 Again, I took this photo from a quarter mile away from Chambord's façade. The telephoto lens is fun to use in the right conditions. On either side of the central section of the castle, two wings connect it to the the royal apartments on the left and the chapel on the right (see the banner photo above). Sunlight shows green through the windows that connect the castle to the chapel. This is a view of the wing that connects to the chapel on the right, or western side, of the castle. I could see people walking through the sun-lit corridor and took a bunch of photos. This is the best one. I prefer another that has more silhouettes, but it came out too blurry. You have to hold the camera very still at this distance if you're not using a tripod. This is what I call the granddaddy of the Loire Valley châteaux. 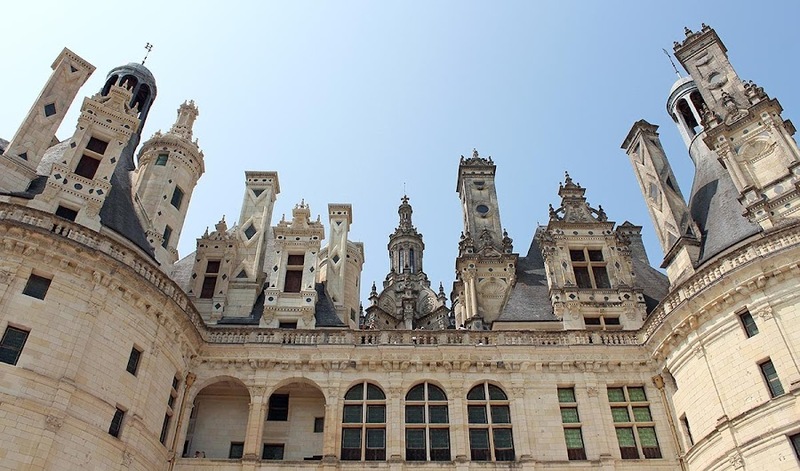 Chambord was built in the sixteenth century by King François I. Well, he had a little help. It's the castle that's featured in my current banner photo, above. We visited a little over a week ago with our American house guests. 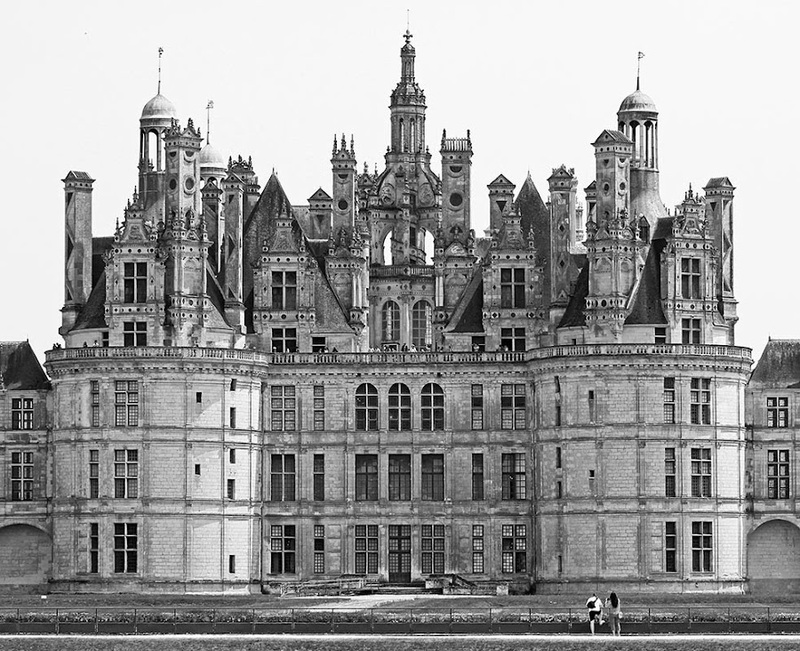 The central section of Chambord castle in black and white. I took both of these photos (the banner and this one) from just about the same spot about a quarter of a mile from the castle with my telephoto lens. It's the classic view of the north façade and the castle's "front door." The tourist entrance (and probably the original entrance) is on the south side where low-rise wings of the building reach around to enclose a courtyard. More practical for arriving carriages full of royal types. I have a few more photos from in and around the castle to show you over the next few days. This time from Notre-Dame-la-Blanche in Selles-sur-Cher. This is the window that made the colorful patterns on the floor a few posts ago. I walked up onto the raised alter to take this shot, something that I'm not sure was very kosher. Ha! The eastern windows in the apse of the church. Today is the final stage of the 100th edition of the Tour de France. They've scheduled it specially so that the arrival in Paris will happen around dusk, which is almost ten o'clock tonight. The starting line is in front of the Château de Versailles, then the course winds its way around the palace's immense park before heading toward Paris. Another novelty this year is that the race will actually circle the Arc de Triomphe at the Place Charles-de-Gaulle. Our friends from Illinois left the Alps yesterday and should now be in Paris. They have seats near the finish line on the Champs-Elysées, so we'll be looking to see if we can spot them on television later tonight. Most of France's churches are not monuments but working houses of worship. In the larger towns, the churches are open to all who want to visit them. They are used for weddings, funerals, and other religious observations in addition to regular or semi-regular celebrations of mass. 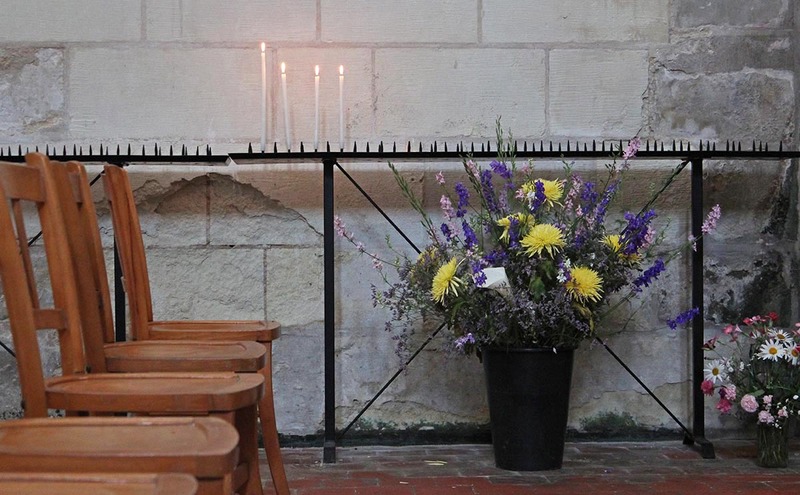 Candles burn in a side chapel of Notre-Dame-la-Blanche, Selles-sur-Cher. As tourists visiting these buildings we can sometimes feel that the big, dark, empty spaces have been abandoned. But they have not. They are meticulously maintained (for the most part) and restored where necessary. The alters are often adorned with fresh flowers. Bulletin boards post schedules of events and other community news for the congregants. And there are always candles. While we were visiting this particular church in Selles-sur-Cher, in addition to a few other tourists, I saw a small number of people walk in, cross themselves, then move to a chair or a chapel to pray. I saw one woman light a candle before beginning her prayer. 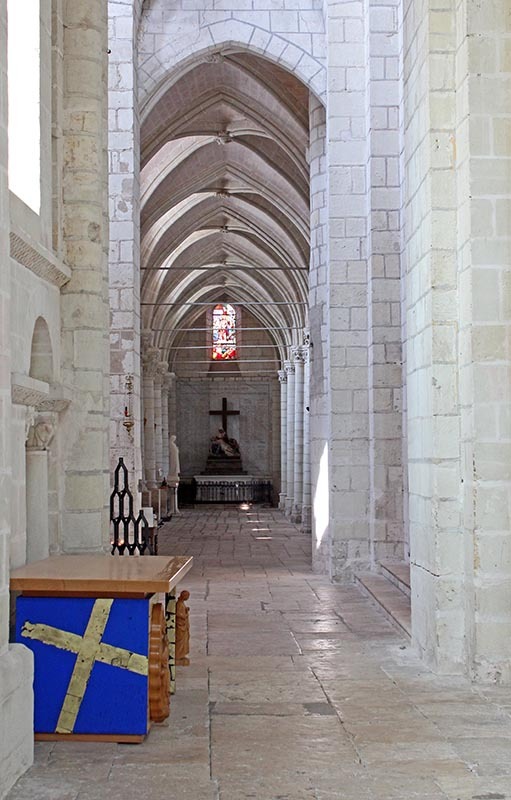 The church in Selles-sur-Cher was established as part of an abbey in the sixth century. It's been rebuilt a few times since then on the same site, over the crypt of the original church which still contains the sarcophagus of Saint Eusice, the abbey's founder. The southern aisle looking from near the transept toward the western end of the church. The church is officially called l'Abbatiale Notre-Dame-la-Blanche. The building certainly is white, owing to the local white limestone used in so much of the region's architecture. This is not the same church from yesterday, but another larger one down the road in a town called Selles-sur-Cher. It's quite an impressive church for a small town, and when the sun is shining through the windows the place lights up. The stained glass makes pretty patterns on the floor. 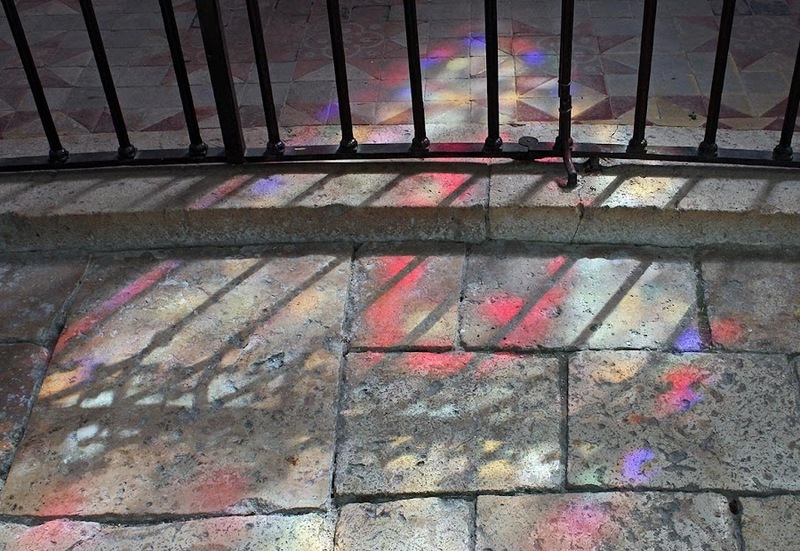 Stained glass patterns and the shadows from the railing on the stone floor of the church's apse. Another very warm day is expected today. Nobody in this house is complaining, although we feel a little hot and sticky by bedtime. Things cool off as the night goes on, so it's not bad at all. And they're saying we're in for some thunderstorms and a little rain on Friday. We'll see. 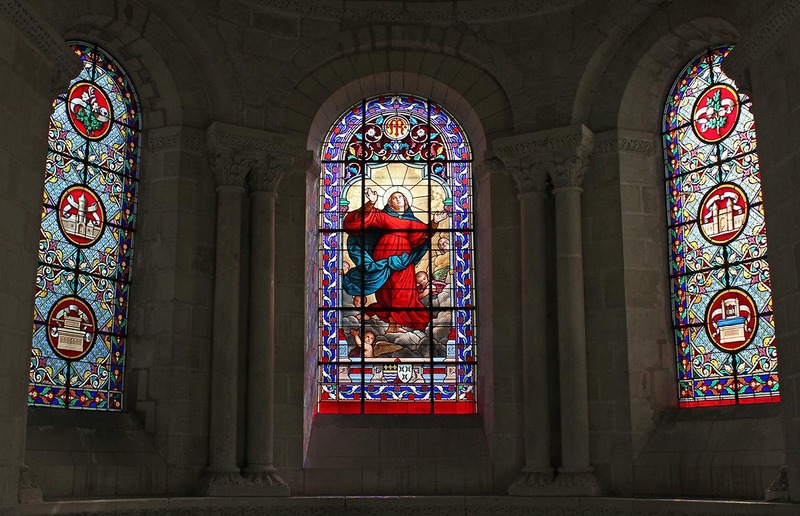 We saw this window in the fourteenth century church of Saint Hilaire in Châteauvieux. The church is very small (it's not the main church in town) and sits adjacent to the castle itself. Normally the building is locked; we've never before seen the interior. Ken tried a side door and it was open, so we walked in to have a look. 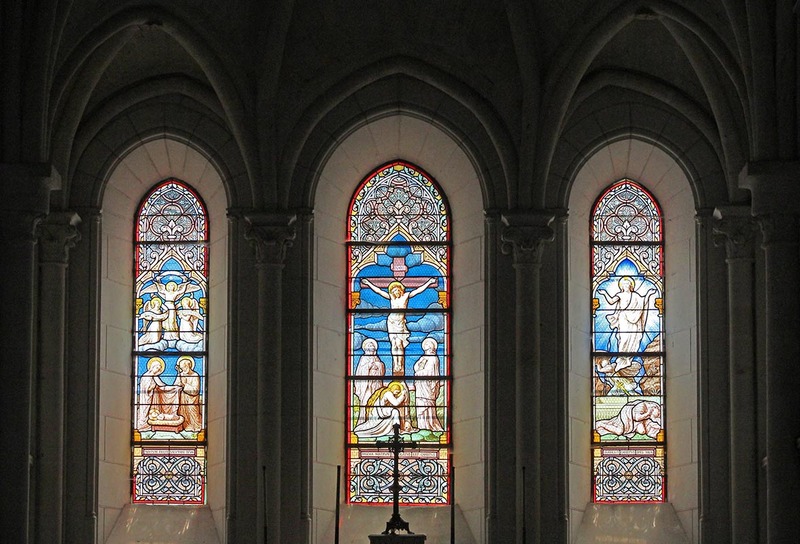 Stained glass windows above the alter in the church of Saint Hilaire. Of course, I had the wrong lens on my camera for interior shots in a small space. I was using the telephoto lens for long shots outside and had left the other lens in the car. Still, I was able to get this in the low light and short space with the telephoto pulled all the way back to 70mm. 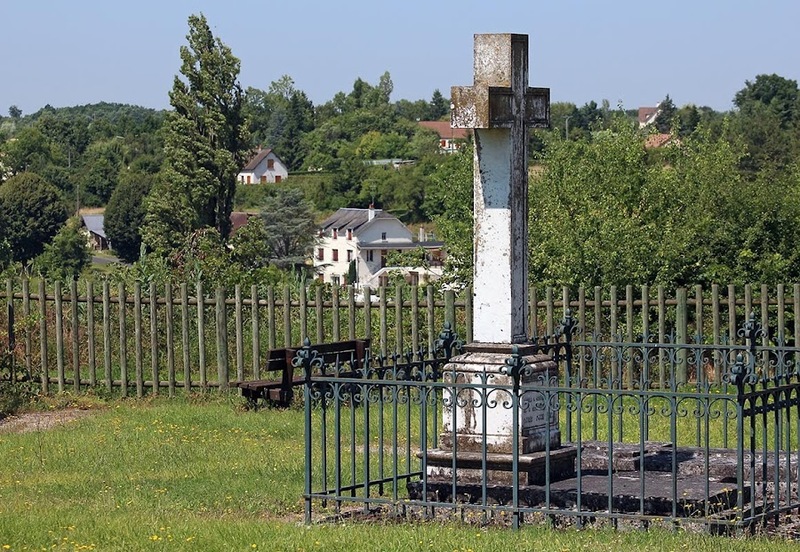 An old cemetery sits next to the medieval church on the grounds of the castle at Châteauvieux. The castle itself, a renaissance-style private manor, has been converted into a retirement home and is not open to the public. Visitors can, however, park and walk around the exterior and enjoy the views of the surrounding countryside from the promontory. The small cemetery is built around this grave, marked by a large stone cross. Our warm weather continues, although we're expecting a little overcast today. It'll be a good day to get a little gardening done. I'm sure I've posted a photo of this bridge before, but here it is again. It crosses the Cher River at Montrichard, a town about ten miles from where we live. Our bank is in this town and they have a good market on Friday mornings (which is why we were there on this past Friday). The bridge at Montrichard on a bright, sunny day (Friday 12 July 2013). On the down-river side of the bridge, across from town, is the municipal soccer field and a campground. The campground includes a big sandy beach on the river where people can swim. I'm sure that beach is getting a workout now, with vacations under way and the spectacular weather we're having. Today is France's National Day, the commemoration of the revolution of 1789 that began with the storming of the Bastille prison in Paris. Our village (and a couple of other towns around us) celebrated with fireworks displays on Saturday night. Bang! Boom! 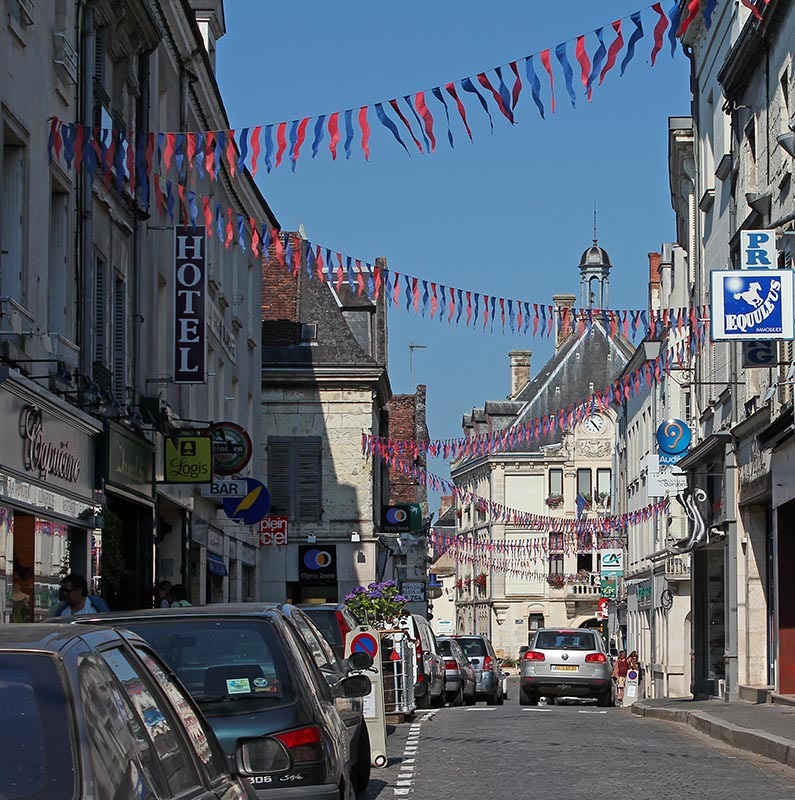 The main street in the neighboring town of Montrichard, decked out for the holiday. We had a full day of tourism with our house guests, including a wonderful lunch in a restaurant's lush garden and a few hours exploring one of the more famous of the Loire Valley castles. We ended the day with wine and nibbles on the deck and decided to turn in rather than head out again to see the fireworks. We still got to hear them. Our hamlet, seen from the west looking over the vineyards and the Cher River Valley beyond. And walking Callie is nice, too. Dry dogs are happy dogs. Well, wet dogs are also happy dogs, but their owners, not so much. ...comes from the Green Dragon. Ok, there's an obscure reference for you. 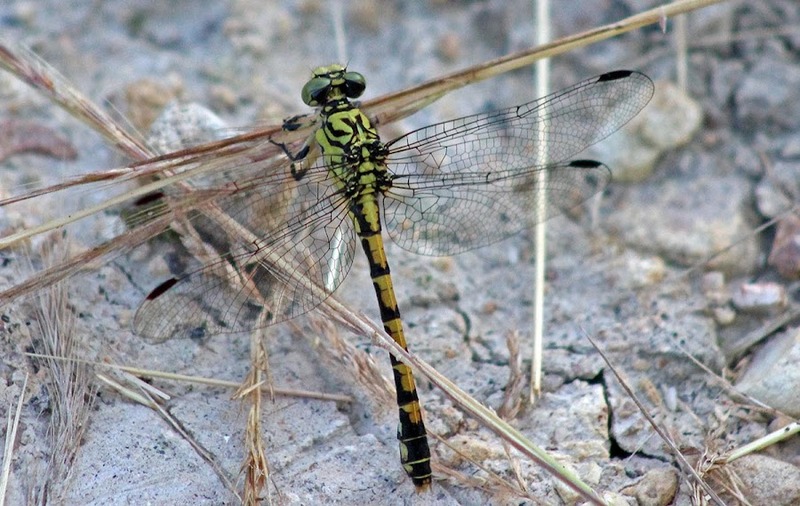 I thought it was fitting to go with this shot of a green dragonfly. He was sitting on the ground the other morning waiting for the sun to warm him up. Of course, I didn't have the macro lens on the camera so I couldn't get a really close shot. 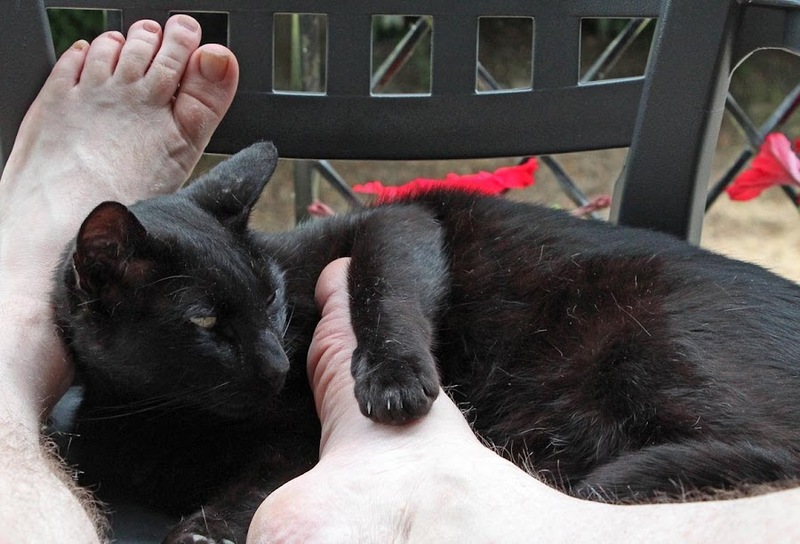 These nice warm summer days are perfect for sitting out on the deck. The deck is in full sun from mid-morning (once the sun clears the trees) until about one o'clock. After that, the sun moves behind the house and the deck is shaded during the hottest part of the day and into the evening. 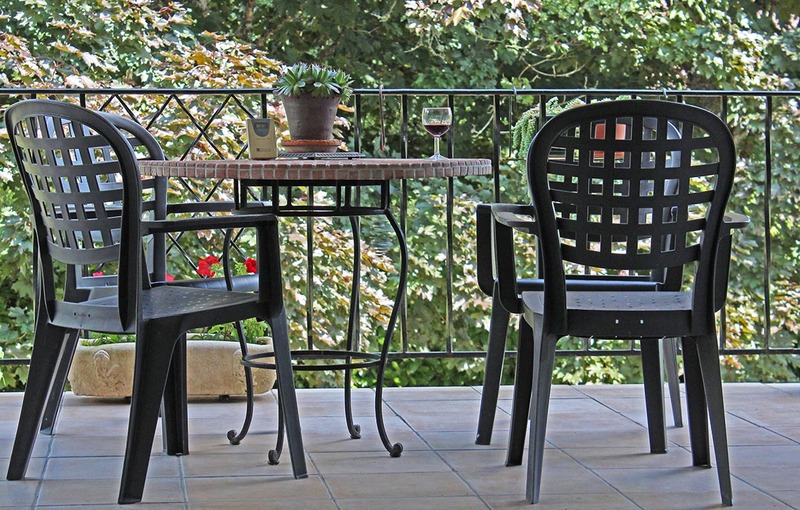 A glass of wine on a sunny summer afternoon. I want to get out and take some photos of the vegetable garden. The weather has been great and the plants are making good progress. There are even some blossoms on the cucumbers now. I've been pinching suckers off the tomato plants like crazy. Many of you have been asking to see what we've done with our blueberries. Well, now is the time. Like I said previously, we've been eating the fresh berries. We finished them on Tuesday. I made some shortcakes and we've been eating those with berries and cream for a few days. The remaining berries are all frozen. 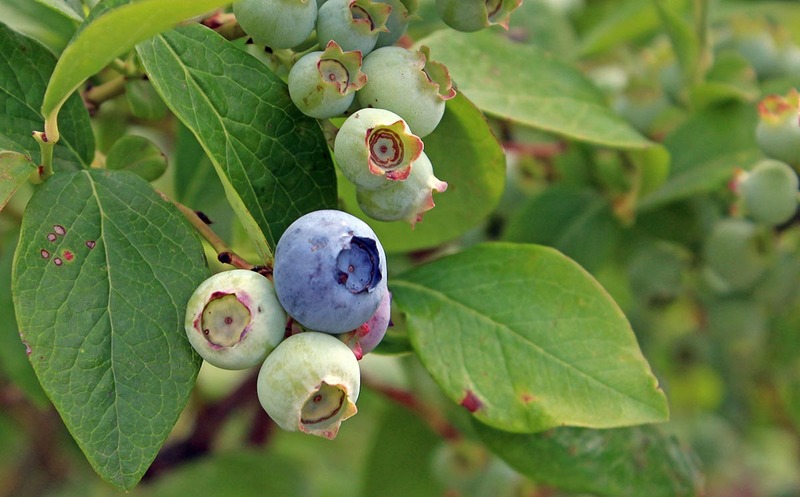 I'm planning to make a blueberry clafoutis this weekend and I'll try to remember to take pictures of it. It's a baked custard with fruit inside, and so a perfect recipe for frozen berries. So here's what thirteen-plus pounds, or over six kilograms, of blueberries look like. I washed the berries in a sink full of water and worked to de-stem them (which wasn't all that difficult since the stems mostly fell off by themselves in the rinsing process). I let them drip-dry in these colanders for a while before bagging them up for the freezer. I won't tell you how many berries I had to re-wash because they rolled onto the floor. It's hard to see in the photo, but that yellow colander is about twice the size of the other two. I ended up with two one-kilo (about two pounds) bags and seven five-hundred gram (about a pound each) bags. The rest went into a container in the fridge. We're still eating those today. 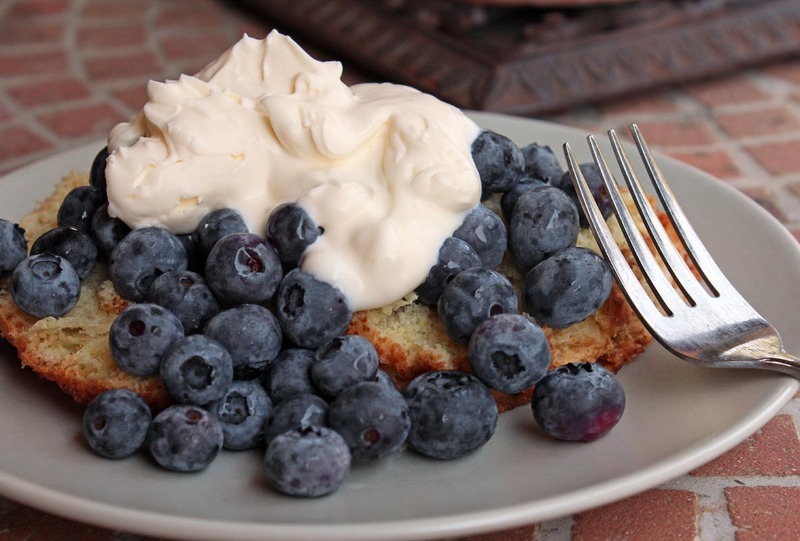 With all the tempting recipes for using blueberries that I've seen recently, the first thing I did was throw together a simple shortcake and topped it with fresh berries and cream. I want to eat the fresh berries while they last. Once they're gone, I can cook/bake with the berries that I've frozen. One ripe berry with many more to come. I didn't take any photos of the shortcake (maybe today), so here's what the blueberry bushes look like. The farm has several varieties with names like Ivanhoé, Bleuette, and Berkeley. The tallest bushes are around six feet, the smallest are three to four feet. I don't know if the small ones are just young bushes or if they're small because of the variety. Rows of blueberry bushes and an irrigation pipe. You can see that the farm wasn't at all crowded with people. The bushes are planted in rows and we just walked up and down the rows where we wanted to find the ripest berries. I noticed that all the bushes were loaded with fruit, and while there were plenty of ripe berries, there were many more that had yet to ripen. The season should go on for another few weeks. The deal was pretty simple: we took containers for picking (buckets) and other flat containers to spread the berries out in after picking. At check-in, a member of the farm staff weighs your picking buckets. After you pick, she weighs them again and you pay for the difference, which is the weight of the berries. The price is €3.50/kilogram. After weigh-in, you have to drive out into the fields to pick. 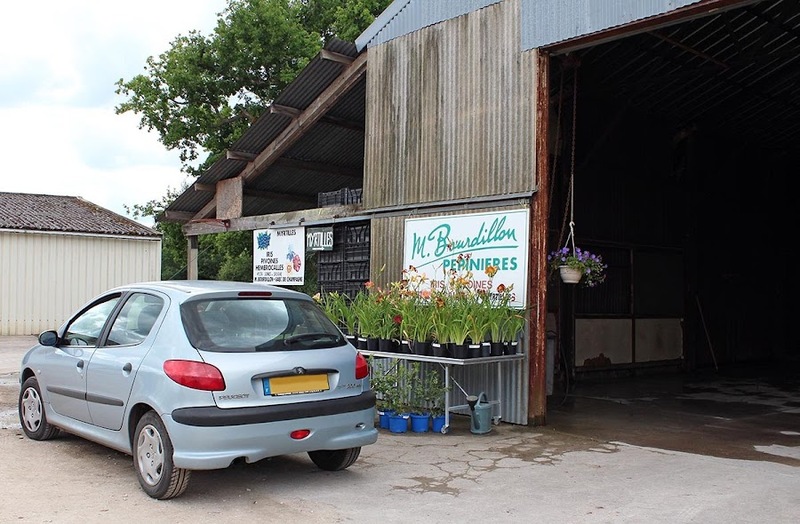 My car parked outside the barn where the weighing and paying takes place. Did you notice that I erased my license plate number? Some people show up with flats rather than buckets. Same deal, weigh-ins before and after. 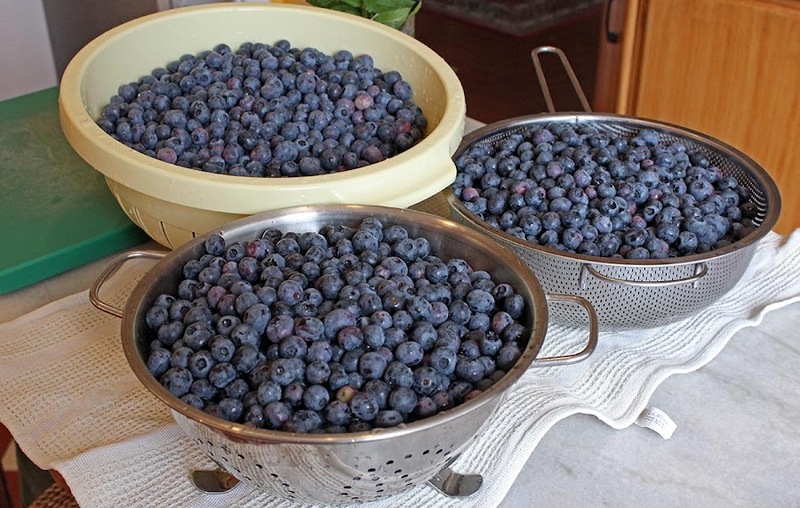 I took buckets and flats, thinking that I shouldn't let the berries stay in the buckets too long for fear they would crush each other. It turns out that the berries weren't that delicate and I just kept them in the buckets until I got home and they were fine. The sign with the price list. 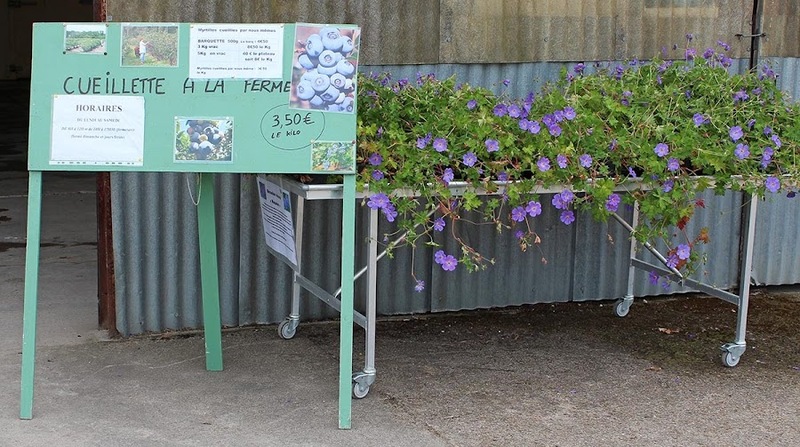 Pick-your-own berries are €3.50/kilo. Already-picked berries are €9/kilo, 3 kilos or more are €8.50/kilo, and 5 kilo flats are €8/kilo. The farm also grows irises, peonies, day lilies, and other assorted flowers commercially. My friend K. told me that earlier in the season, when the fields of irises are in bloom, the sight is amazing. I'll bet it is. In July the blooms are all done and the fields aren't as impressive. But the blueberries are ripe! On Friday I went with friend K. to a pick-your-own-blueberry farm not far from us just outside a town called Soings-en-Sologne. This was my first time, but K. is a seasoned pro. She chose a perfect day; the weather was sunny, warm, and dry, and she advised me in advance on what equipment I'd need. We arrived at the farm at around 10:00am and picked for about an hour and a half. At the farm's entrance you're greeted by this sign. You can't miss it! 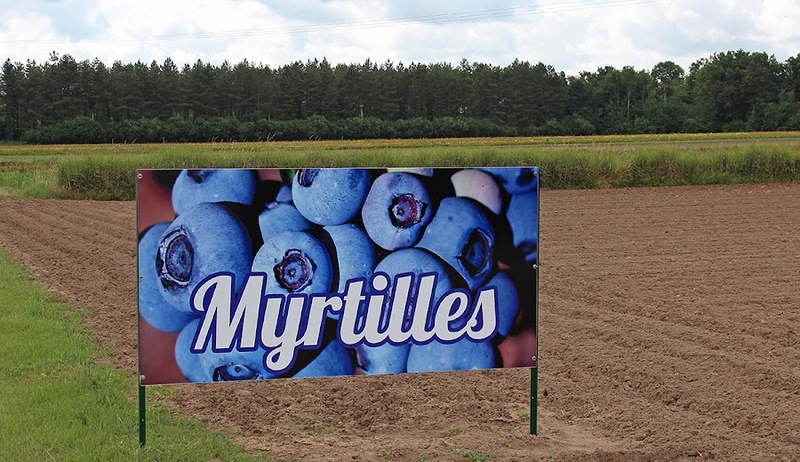 Blueberries are called myrtilles in French -- I think they're called bleuets in Québec. We each ended up with close to seven kilos of berries (about 14 lbs.). I didn't realize we had each picked so much. But they freeze well and we'll certainly use them in recipes over the summer. I saved some fresh berries out for eating in the next few days. In fact, today I added blueberries to some yogurt for my dessert. Delicious! 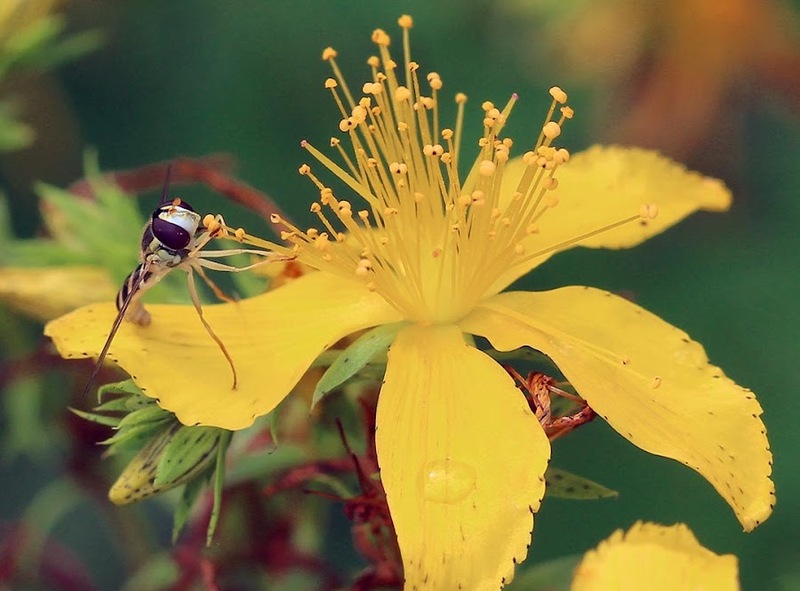 I followed this little flying insect around for a few minutes as it hovered around these flowers. Once it landed I got in for a few shots. This isn't the best view of the bug, but the better one is slightly out of focus. This one will have to do. You can barely see it, but the upper side of this insect's abdomen is dark and light striped. It looks like he has his proboscis wrapped around some pollen. The Tour de France churns on. Yesterday the racers passed through Provence and places I've been to a few times. It was fun watching aerial coverage and seeing familiar sights. That's the best part of the Tour for us non-cycling types. We made pizza for lunch last Saturday. 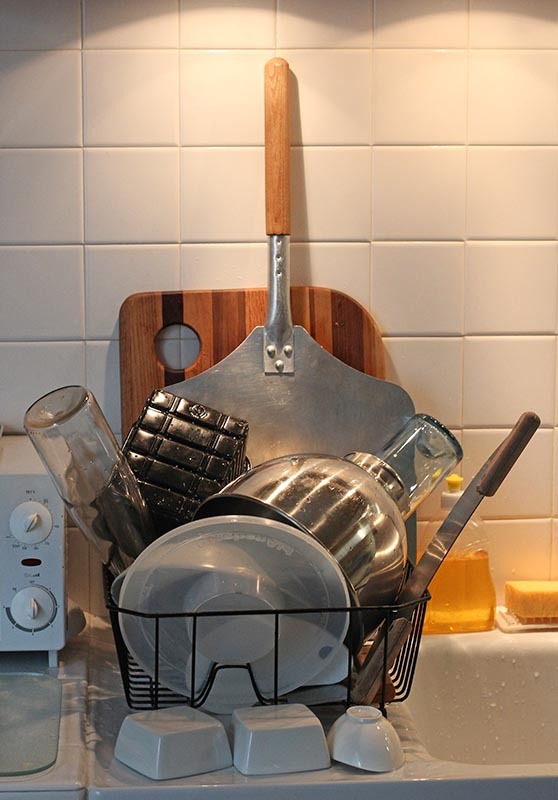 I didn't take any photos of the pizza itself, but once I got the dishes done I thought they looked interesting in the drainer, so out came the camera. I made the dough with almost-whole-wheat flour (farine de blé semi-complète) and it was great. Still life with dripping. Cutting board, pizza peel, dough mixing bowl, pizza knife, toppings bowls, and wine bottles. Party! It's overcast again this morning, but the clouds should be clearing out during the course of the day. 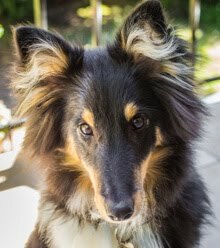 Predictions are for a week of sunny and warm (almost hot!) days ahead. L'été s'installe. 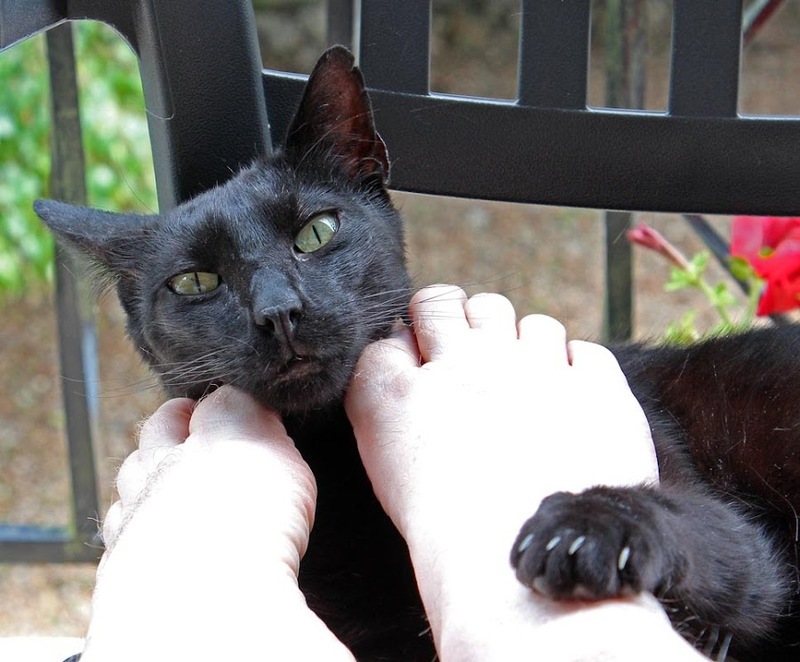 Soft kitty, warm kitty, little ball of fur... Bert came up on the deck Tuesday afternoon and decided to cuddle up with my feet. Silly cat. Ken is heading to Paris today for a few days. I'm staying home with the animules. And I've got grass cutting and other gardening chores to do. The vines have started to take off and now the flowers are open. Soon we'll see little bunches of grapes out there. The growers have been spraying to keep mold from establishing itself on the leaves. Pretty soon they'll be out there cutting the vines back to channel growth and sunshine to the emerging grape bunches. 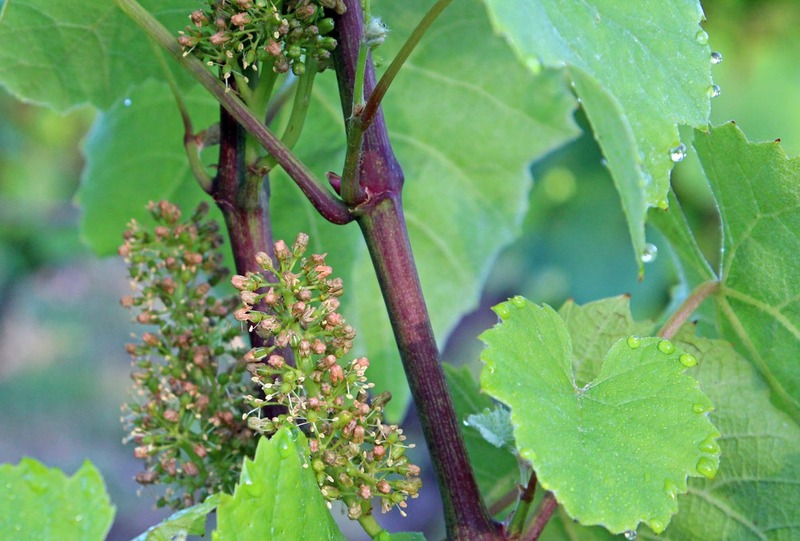 Grape flowers are not very big and not particularly pretty. But the grapes will be great! It's been warm and dry for the past few days and I've had to water the vegetable garden. I'm still using water collected from the roof runoff (it's free! ), but that's just about gone and soon I'll have to use the hose. That's not so free. These aren't garden peas, but the seed pods of a flowering shrub that grows wild around our region. I think it's genêt (broom) or something closely related. 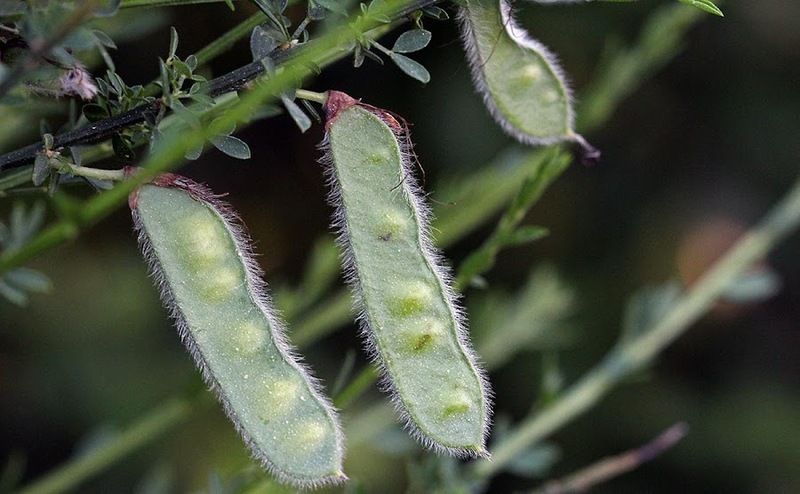 As they mature, these pods will turn dark, almost black. 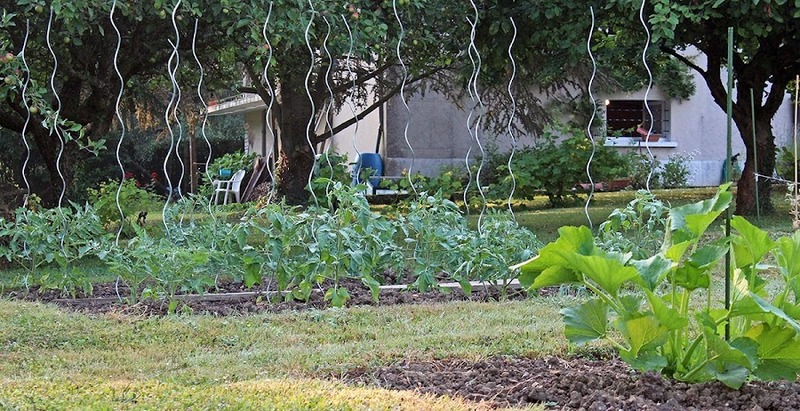 We do have some garden peas in our vegetable garden. They're still small, but they are flowering and are actually producing pods. We don't have nearly enough for a harvest yet, and may not, as the plants are not growing very tall at this point.